The calendar year is tapering quietly to its end; here in Mainz, the days are rainy and the archives are closed, providing ideal conditions for retrospection on a year of opera-going. 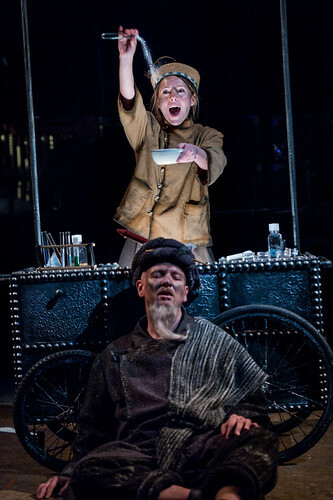 I've already been enjoying the reports of others on the year in opera: John Gilks at Opera Ramblings, Mark Berry at Boulezian, and the anonymous Opera Traveller. My own year of opera has been an unusual one, divided as it has been between two continents. 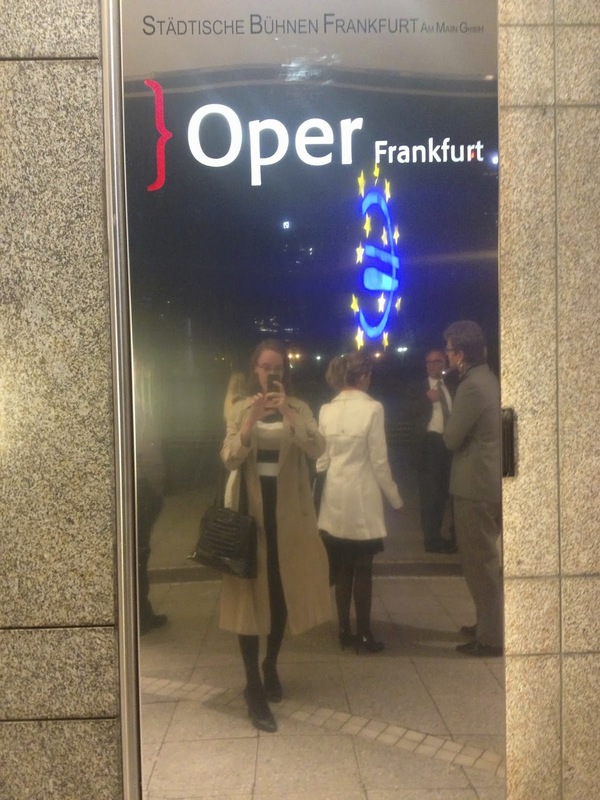 While I miss the sheer exuberant variety of NYC's opera scene, I have loved discovering the work of solid house ensembles in Mainz and Wiesbaden, and the consistent intelligence of Frankfurt's musically polished productions. 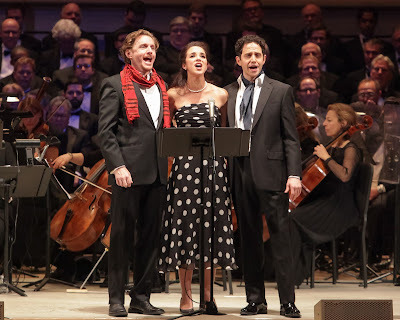 So, without further ado, Gentle Readers, I present my entirely subjective roundup of favorite performances this year: ones that have afforded not only excellent nights at the opera, but lingering memories pleasurable and thought-provoking. At Oper Frankfurt, Brigitte Fassbaender's new production of Ariadne auf Naxos proved intellectually stimulating and warmly humane, with humor and hints of mysticism that both served the work well. The orchestra shone, and the singers not only handled Strauss' music beautifully, but worked beautifully with each other as an ensemble. Also in Frankfurt, I witnessed the minor miracle of a non-sexist Tannhäuser production, with overwhelmingly gorgeous orchestral work (yes, I got teary,) and very fine Wagnerian singing. The Met's all-too-brief revival run of Dialogues des Carmelites was a perfect way to bid a (temporary) farewell to the house that's been my home base for the last five years. John Dexter's production remains striking and effective, the orchestra is of course brilliant, and the cast was truly superb. The Firework-Maker's Daughter was another highlight of my spring season. A children's opera, you ask, Gentle Readers? Yes: and an opera that used small forces creatively, is both humorous and poignant, critiques sexism in opera and society (hooray,) and boasts well-set text and memorable music. 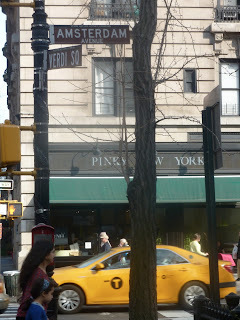 I am still unreconciled to the sad demise of New York City Opera. Its last spring programming was so good, and so well-received, that it seemed to promise happier days ahead. Thomas Adès' Powder Her Face--mordant and musically creative--was presented with a uniformly strong cast in a bold production. I'm very glad I got to see it. Like many other opera houses, the Staatstheater Wiesbaden is presenting Hänsel und Gretel during this festive season, and I took myself to yesterday's performance as a Christmas treat. Fine orchestral work, a carefully revived production, and strong vocal and dramatic performances made it a treat indeed. Heinz Peters' 1982 production, currently in its last season, took its aesthetic straight from the children's books of the turn of the twentieth century. There were a few moments which veered from sentiment into sentimentality, but on the whole, I found it quite charming, and pleasingly unfussy. To the credit of the revival director, choreography was carefully attuned to the score, and the characterizations of the principals were anything but lazy (a lesson could be given to larger houses.) Zsolt Hamar led the orchestra with a light touch, choosing relatively brisk tempi, which I liked. The orchestra gave a spirited performance; there were a few unsteady moments in the brass, but matters were overall well-coordinated and admirably detailed. Mentioning my passion for opera to new acquaintances has elicited a near-universal comment on how fortunate it is that there are multiple houses in the region. A good handful of people piqued my interest by following this remark with: "Have you been to the house in Wiesbaden yet?" While Frankfurt sits preeminent among the companies within easy traveling distance, local consensus seems to be that Wiesbaden is, by some margin, the most beautiful house. And on Tuesday, I found out why. Prokofiev's L'Amour des Trois Oranges has been confusing many and delighting some since its premiere in 1921. (As a clarifying note: the text was translated from Russian into French for its first performance; given in Wiesbaden in German as Die Liebe zu den drei Orangen, with the original Любовь к трём апельсинам on drop curtains.) At that time in America, Michael Pisani notes, "Modernist techniques in other arts were not unheard-of, but were considered grossly inappropriate for the opera house." To complaints about a lack of singable tunes and suspicions that Prokofiev was (gasp!) poking fun at opera audiences, the composer responded that he sought simply to create a diverting piece. Both the irreverent text and the multilayered score, however, would seem to belie such a facile summing-up. It's easy to see the self-absorbed prince and his clever sidekick, not to mention the warring magicians, the fragile princesses, and the cook with the deadly soup ladle, as parodic send-ups of operatic archetypes, while the warring audience factions of the prologue who constantly characterize the piece as being insufficiently comic, tragic, or romantic, are almost impossible not to read as a commentary on opera and theater audiences. 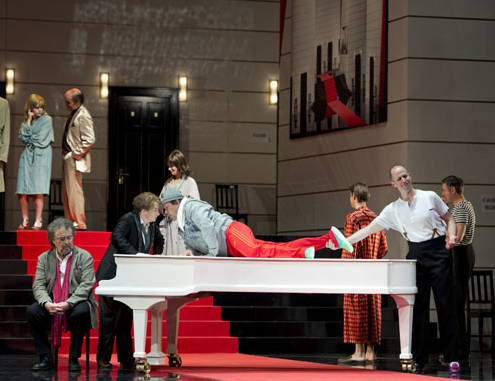 The current run at the Staatstheater Wiesbaden, of which I saw Tuesday's performance, boasts a crisp orchestral reading and a clever production, but in it, critique and comedy seem like strange bedfellows. Pushkin wrote about the sensibilities of a world on the point of vanishing, and Johannes Erath chose a moment of societal transition for his production, as well. The costumes of Noëlle Blancpain suggested the self-conscious modernity and self-conscious nostalgia of the early 1960s, and were also used cleverly in characterization (Olga gets neon colors, Tatiana a pillbox hat, Onegin a white dinner jacket, Lensky a Walther PPK.) Generally, the production seemed much more attentive to the text than to the music. The Nurse, who panics about having forgotten what she once knew, is the anguished guardian of gentle traditions, clinging to a silver samovar in the rapidly rattling train where the first scenes are set. Photographic backdrops suggest the inability of the travelers to linger in the landscapes so lushly described by Pushkin. Even the train compartments gradually separate, pulling people together and apart. Assuming increasing centrality during the letter scene is a photo booth: that curious mechanism meant to enshrine moments trivial almost by definition. While the surrealist touches of the production could be claustrophobic or playful, the society portrayed was essentially (and oppressively) ordered, gradually forcing the conformity of all the principals. Sunday Special: Macht hoch die Tür! Paris in November. Photo via Buttered Bread. If the persistent grayness of November is getting you down, Gentle Readers, I have a suggested pick-me-up. 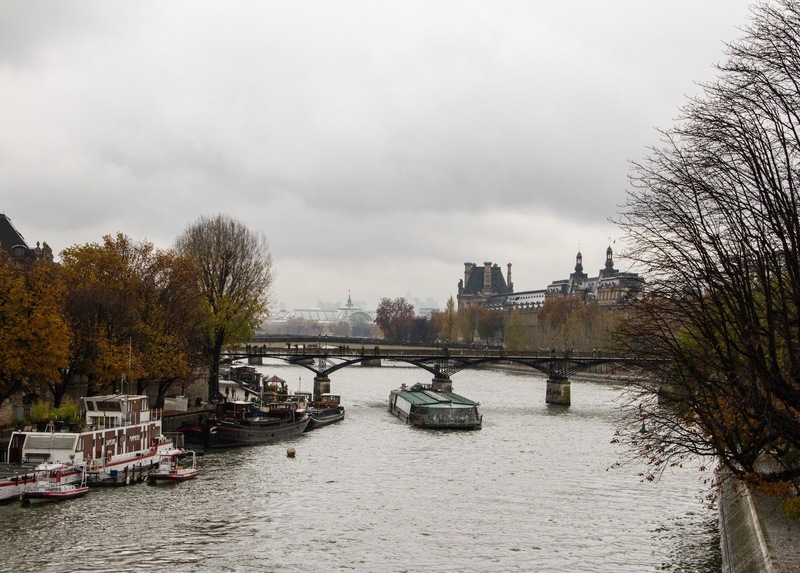 The end of October saw two new releases of French art song and popular chanson. Anne Sofie von Otter's Douce France is a two-disc bounty of gems from Reynaldo Hahn to Charles Trenet, while Natalie Dessay's Entre elle et lui is a collaboration with Michel Legrand, and an exploration of his oeuvre. While they're very different projects, I think each is remarkably successful in what it sets out to do. I could go on for ages about Anne Sofie von Otter's gifts as a singer of art song (as, indeed, I have in the past.) In contrast to her obscenely lush Les nuits d'été , her voice here is clearly that of a mortal being. And Von Otter sings with great vulnerability, employing a conversational style unusual to the art songs, and illuminating. At this point in her career, it could go without saying that Von Otter has an inspired gift for phrasing, and impeccable attention to text, but these are qualities which give constantly new delights, so I'm mentioning them anyway. Her treatment of the Hahn songs on the disc is playful and sensual, with "Le plus beau présent" and "Quand je fus pris au pavilion" as highlights. She is well-partnered by her pianists, with Richard Strauss allusions in the instrumental part in "Puisque j'ai mis ma lèvre" (at least, I think the allusion is to "Cäcilie," if it's not to something more obvious that I've missed.) A refreshingly unhistrionic take on Saint-Saens' "Si vous n'avez à me dire" was poignant. The impressionists were also well represented, with Ravel's "D'Anne jouant de l'espinette" and "Ballade de la reine morte d'aimer," and Debussy's gorgeous Trois chansons de bilitis. The name of composer Charles Martin Loeffler was new to me; Von Otter gave two passionate, winsome selections from his "Four poems for voice, viola, and piano." Even in the midst of my researches, Gentle Readers, I find myself reminded of opera. 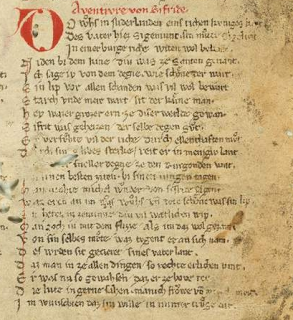 This week, I discovered (while looking for much less flashy legal texts) that manuscripts for several of Wagner's source texts have been digitized. 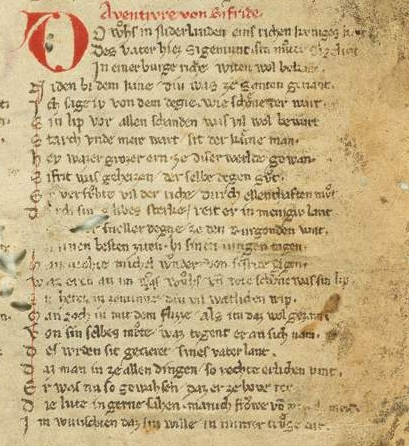 So whether you have a hankering for the thrill of reading a handwritten copy of Das Nibelungenlied (as who does not?) 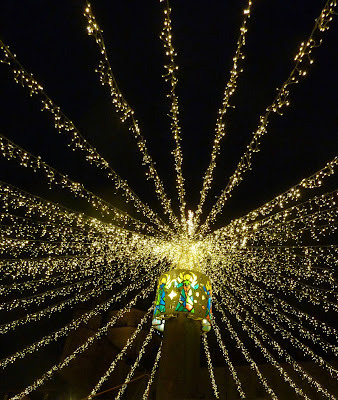 or just want to look at some beautiful images, I have links for you. First up: Das Nibelungenlied. Pictured is the first section post-prologue, The Adventures of Siegfried (Aventiure von Sifride.) Good news for all my fellow Walküre-lovers: the first thing we're told is that "Siegfried was a true child of royalty, whose father was called Siegmund, his mother Sieglinde." If you want a line-by-line rendition of the text pictured in readable type, go here; if you want a transcript of the whole thing based on Handschrift A (pictured,) go here; if you want to look at the whole manuscript, go here. If this has piqued your interest, but you just want to read it in English, don't worry; you can do that here. 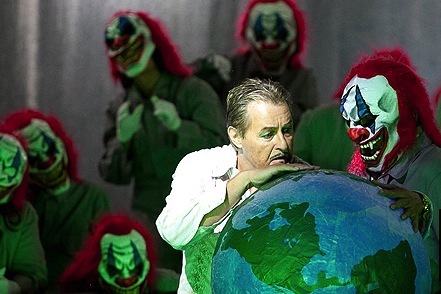 Next: Wolfram von Eschenbach's Parzival, for triple Wagner-opera points. 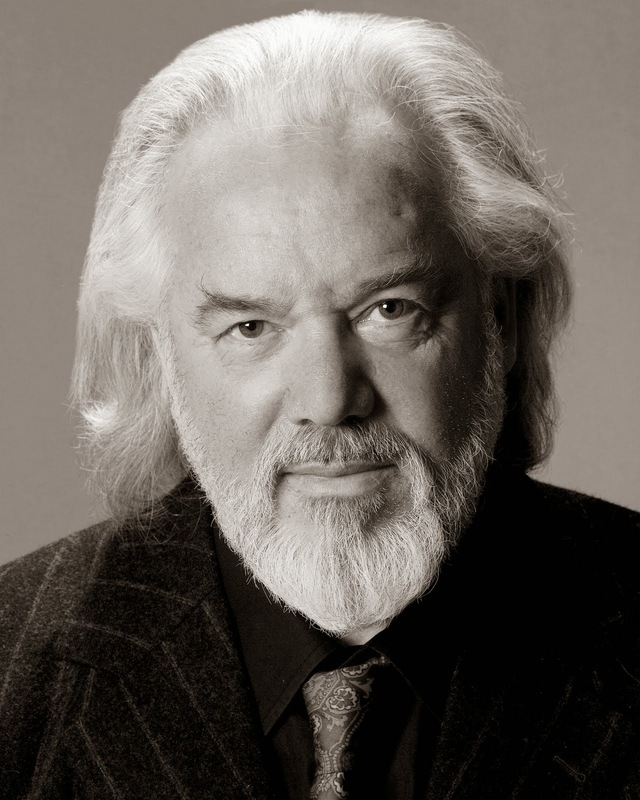 When putting Sir John Tomlinson's lieder recital on my calendar, I anticipated being immersed in a world of antiheroes and demigods. Instead, Tomlinson used the Michelangelo settings of Britten, Wolf, and Shostakovich to meditate on the fragile beauties of humanity (full program available here.) With Tomlinson's artistic choices--and persona--the angst I associate with the cycles faded into the background, and insight laboriously carved from experience took center stage instead. The audience was far from filling the house ("almost insulting," said a lady in front of me who had brought her CD booklet to follow along) but genuinely attentive and well-mannered. To my surprise, the stage was furnished with more than a piano: a table and chair, an easel, and a large chest of the sort ubiquitous in early modern urban residences; given the themes of the evening, the latter might be construed to suggest a coffin. Sir John himself was clad in a very distinguished ensemble reminiscent of the belle epoque, with cuffed trousers, waistcoat, and silk cravat; over this he donned a painter's smock which might belong to any century. If not representing Buonarotti, then, did he stand in for The Artist? Any artist? In the end, I felt the trappings were extrinsic to the story he told, which was one of closely observing humanity, celebrating and comforting our mortality by revealing it anew. The scenario of Verdi's Vêpres siciliennes, with pervasive corruption and radical resistance (and doubts about what forms resistance should take) is only nominally medieval; Verdi moved the action from the 16th century to the 13th in order that the opera might safely serve as a political rallying cry in his own day, and the twentieth and twenty-first centuries have certainly offered all too many instances of similar oppression and violence. The music is itself permeated by this violence. Although written in the Meyerbeerian tradition of grand opera, the unsettled, unsettling orchestration and structure are unmistakably Verdi's own. The opening chords foretell no good; in this production, a gunshot proceeds them, explaining the foreboding. This deed is done in silence and darkness; but as it turns out, it is not (only) a characteristic abuse of power. 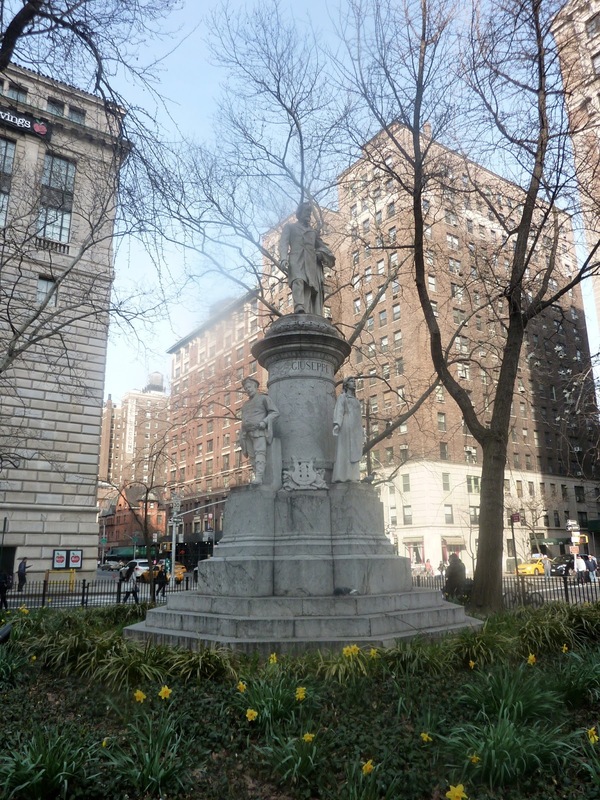 When the thugs have gone, men and women of all ages materialize, at first singly and then in greater numbers, to furtively lay candles and flowers at the site of the murder. The photograph pinned above these tributes is that of Helene's brother, the murdered Frederic. 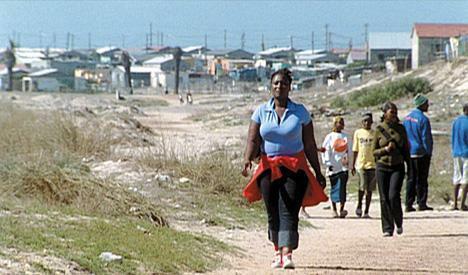 (I give the French names, as Die Sizilianische Vesper was here given in its original language.) 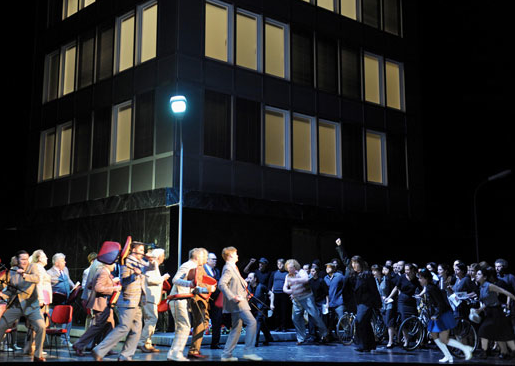 The production of Jens-Daniel Herzog for Oper Frankfurt sets the narrative amid Germany's own political upheavals of the 1960s and 70s; the turning points of the action, like the psychological states of the characters, are always attuned to what's going on in the orchestra. I personally found that Herzog's production made me more alert to the tensions among the revolutionaries, and to the musical representations thereof, than I'd been in previously listening to the piece. The political background never becomes more clearly defined than it is by Verdi and Scribe, but thanks to strong ensemble work and good relations between stage and pit, the emotional and psychological narratives of the piece were vividly realized. Mefistofele and the empty world. Arrigo Boito's under-performed Mefistofele seems to be enjoying a revival of sorts (there's a run in San Francisco and an upcoming concert performance at Carnegie Hall.) It also served as the stirring season opener of the Staatstheater Mainz, where I've just basked in its gloriously ambitious romanticism. Mainz boasts a strong cast, and a production where unexpected coups de theatre build emotional as well as dramatic suspense. More production photos can be found here, but they convey only a fraction of what actually happens on stage. The singers worked well together, as well as exhibiting individual commitment, and the cumulative effect was quite impressive. Boito's Gesamtkunstwerk is filled with the deliberately anarchic, the musically unexpected; that it all adds up to an intriguing, exciting whole is not the least of its surprises. Well, Gentle Readers, I've survived an international move, mostly gotten over jet lag, and sort of figured out the local public transit system. This means, of course, that it's time to figure out the local opera schedule. Fortunately, the Staatstheater Mainz has day-of half price tickets for all students. They also have those sleek, libretto-quoting postcards you see on the left. I have to say I prefer them to the "Look at this exotic thing!" 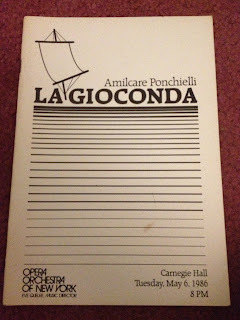 advertising I've received from opera companies in the past (ahem.) Mefistofele and Macbeth are on the program for this month, so lots of exciting orchestration is hopefully in my future. The orchestra itself has an interestingly varied program, ranging from Buxtehude to Cage and beyond, so I may explore their offerings as well. Gentle Readers, I thank you for your forbearance during a summer of irregular and infrequent blogging. 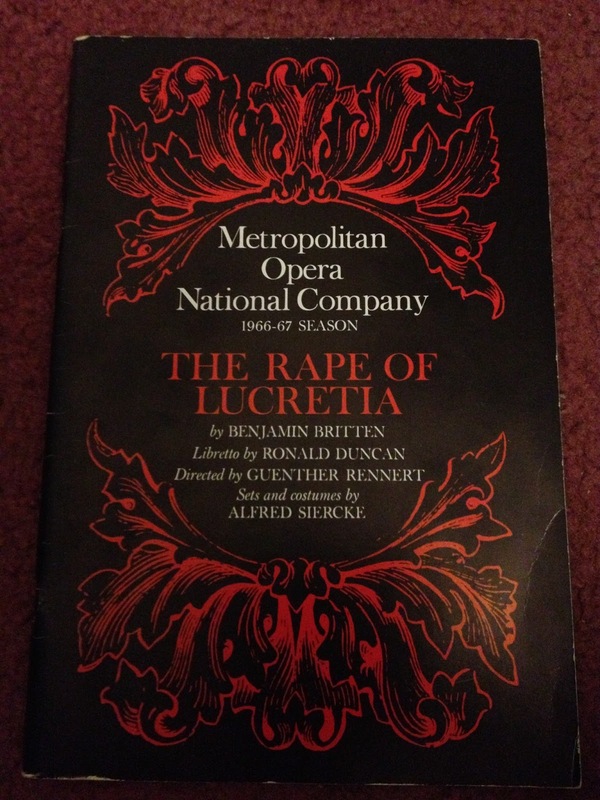 I have been rusticated for the past months, far (alas) from live opera. Withdrawal symptoms have definitely set in. But now, the end of this hiatus is in sight! Zerbinetta over at Likely Impossibilities has a handy summary of what there is to look forward to at the Met. I, meanwhile, will be in Europe! Not only will I be in Europe, I will be in Germany, land of delicious bread, of infinite Wurst, and of lots and lots of opera! I'm feeling very, very fortunate to have my work take me to a country with over fifty opera houses, and looking forward to getting to see new singers, new houses, and new productions. Gotham Chamber Opera has made a specialty of presenting unusual opera in unconventional spaces. Their production of Daniel Catán's early work, La hija de Rappaccini, creatively uses modest resources in the luxurious setting of the Brooklyn Botanic Garden. The libretto is both more profound and more enigmatic than the Hawthorne story that forms its original source material. Juan Tovar, working from material by Octavio Paz, crafts an elliptical parable about humanity and nature, about humanity and the divine, which asks at least as many questions as it answers. The biblical imagery in which it is steeped was not always reflected in the surtitles. The last thing we need may be one more operatic heroine whose "tragedy is also her transcendence," to quote Gregory Moomjy's program note, but the eponymous Beatriz possesses a dignity and clear-eyed wisdom which are at least some consolation. This run of performances is given in a reduced orchestration by the composer of his 1988 opera.. Two pianos, timpani, and harp create an eerie soundscape, their knowledge of events and emotions often preceding that of the characters. The characterization through the score is also very strong, and as the passions of the principals set them on a collision course, the orchestra expresses their doom and sympathy with their doom. Gotham's musicians (including Andrea Puente Catán on the harp) were led by Neal Goren in a strongly atmospheric performance. Morningside Opera is currently performing a run of ¡Figaro! 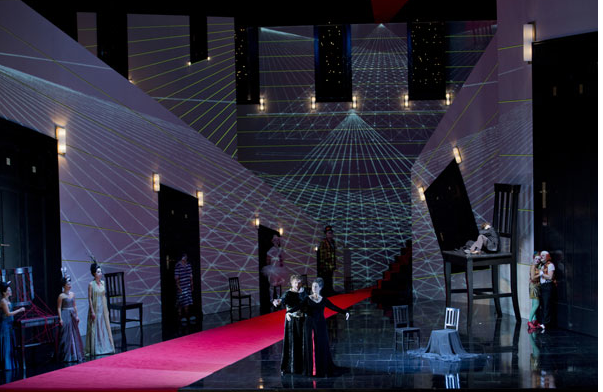 (90210), an opera consisting of a rearrangement of Mozart's Nozze score to a libretto by Vid Guerrerio based on Da Ponte's. Guerrerio's vision for the updated plot results in substantial cuts, an addition (fleshing out Cherubino and Barbarina's relationship) and some reordering. Its earnest determination to comment on and satirize the opera's themes of class conflict and exploitation (and friction between genders and between generations) leaves less space than the original for whimsy and for psychological development. The libretto is often clever, and sometimes incisive, especially in Figaro's music (the critique of unbridled capitalism and white privilege in "Aprite un po' quegli occhi" is nothing less than brilliant.) To my mind, however, it was somewhat overladen, making it a little less than the sum of its parts. Still, it's an interesting experiment in what seems to be a growing trend of transladaptation (compare a Toronto take on Nozze, or Peter Brook's truly magical Flute.) In this performance, the score was arranged for string quintet and piano with surprising success. Music director Raphael Fusco led from the piano, and the phrasing and internal contrast between the instruments were both handled admirably. The cast of singers had good rapport with each other, and turned in a creditable collective performance, with Carlos Monzon a standout as the charismatic Figaro. While I like Kenneth Branagh as a director, love Mozart (obviously,) and have a thing for First World War dramas, I wasn't sure what to expect of the confluence of these three in Branagh's 2006 film of The Magic Flute. Frankly, I was a bit dubious as to how the unwieldy drama and sublime music would be adapted to an alternate history of the Western Front; but in the event, I was won over. The film is unapologetically whimsical, even absurd (to an extent I haven't seen Branagh indulge as a director since Dead Again ; here its sheer exuberance recalls Buster Keaton routines.) It's also, however, tender and thoughtful; it doesn't confront very seriously or for very long the historical horrors on which it's loosely based, but this is because of its irresistible sincerity of belief in the fact that love does, in fact, conquer all. 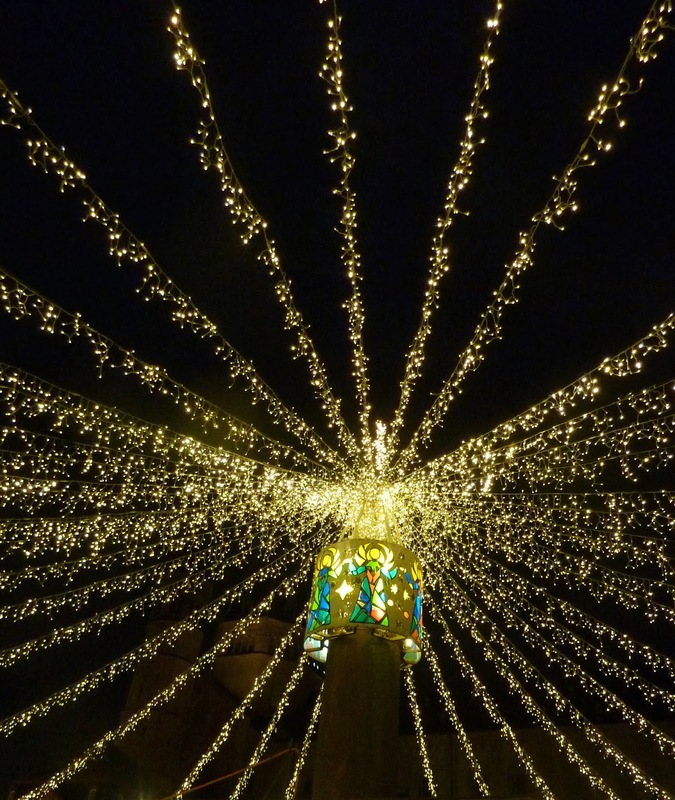 In Sarastro's vision, there might just be a way to break the cycle of "war to end all wars," and make peace. That this is Sarastro's vision is not at first clear--one of the things I liked most about the production is that it kept me actually guessing as to the characters' motives, and as to what would actually happen to them. Stephen Fry's transladaptation (to borrow a term from Definitely the Opera) of the libretto is sly and sure-handed, eliminating much of the racism and misogyny while cleaving closely to the German vowel sounds, and the musical values are solid. James Conlon leads the Chamber Orchestra of Europe in a lively and nuanced account of the score, sensitive to the emotional journeys of the characters. (There are some cuts, but the only substantial ones to the spoken dialogue.) 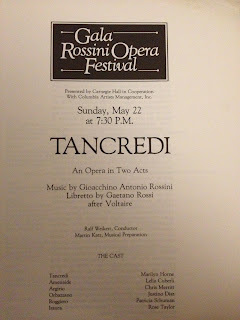 Joseph Kaiser's Tamino (more likable than most within the first 60 seconds) and René Pape's Sarastro were vocal and dramatic standouts, but the singing was fine all around. I don't mean this as damning with faint praise; on my home speakers, the recording had a tendency to flatten singers' sound, so it was difficult to evaluate the sound they were actually producing. Still, the singing was on the whole musically intelligent, as was (notably and commendably!) the direction. The way the film was shot was itself interesting, with creative camera angles and color palettes, and also related well to the music, I thought (if occasionally succumbing to literalism.) Opera and film being vastly different art forms to begin with, I thought Branagh's gleeful creativity with the latter medium provided a good argument for adapting the former to it. Affection for both Mozart's opera and the possibilities of film animates the endeavor, which I found unexpectedly winsome and touching. The network of theaters screening opera opened the way for its belated U.S. premiere; for showings go here. I went to Saturday's concert with the New York Philharmonic for the sake of Luigi Dallapiccola's rarely performed Il Prigioniero, but ended up being entranced by the Prokoviev violin concerto which preceded it, as well. Alan Gilbert and his orchestra were on very fine form. The degree of subtlety which they achieved in the concerto, and the sheer variety of orchestral textures in the opera, both were very impressive. I thought the latter might have used a little more dynamic restraint, but I don't know the score, and the overwhelming quality of the fortissimi may have been just what was called for. Prokoviev's first violin concerto is singularly lovely; in this performance, it also registered as uneasy and elegiac. Its unusual form and unusual melodic patterns seemed to be gesturing towards an inarticulable truth. Lisa Batiashvili played with clarity and, in the first and third movements, with a haunting, remote melancholy of tone. Within the melancholy of the first movement she found extraordinary nuance, using the melodic progressions to move from near-anger to reflection sensual and sad as a rainy day, expressing questions of hope and fear. The strings supporting her were soft and smooth, the winds skillful and sympathetic in their echoing of the solo line. Gilbert emphasized the aggressive plurality of conflicting orchestral voices in the scherzo, with malicious pizzicato strings, wild winds, and dangerous brass. Batiashvili too embraced the unsettling mischief of the movement, varying her bowing technique, sometimes sweeping or bouncing against the strings, sometimes playing with almost delirious fluidity. Against the driven rhythms of the strings, the anxious questioning of the woodwinds, the plunging brass in the third movement, the dreamy romanticism of the solo violin wins an improbable victory. The intensity of the opera, in the second half, was of a different nature. I'm not quite sure why it took a cloudburst and a spare half hour before a performance to drive me into Westsider Records, as this pleasing warren of dusty shelves is barely a stone's throw from the Met. 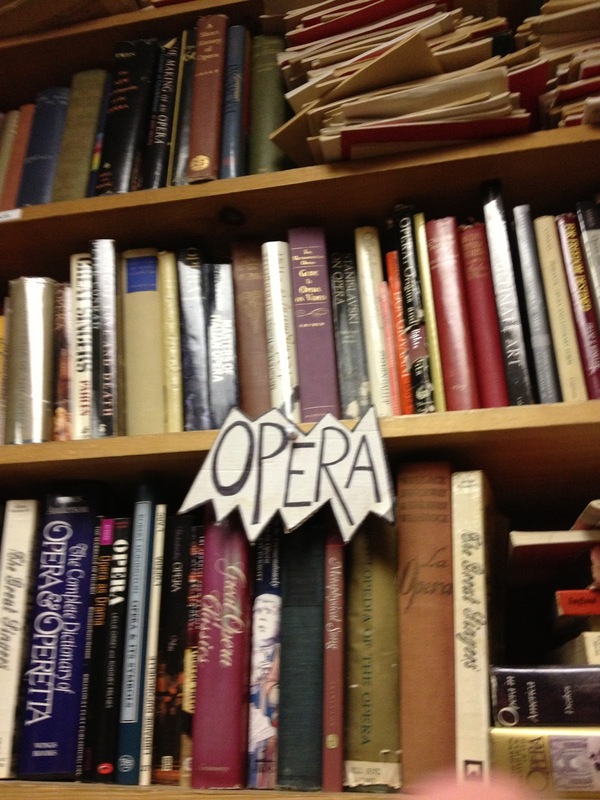 Once there, I browsed over the CDs, regretfully passed by the LP selection (taking out Fischer-Dieskau in Reimann's Lear for the sake of handling it) and found my way to the helpfully-labeled shelf of opera books. Now I confess, Gentle Readers, that I have a weakness for opera libretti. They're so useful! So cheap! So slender, and easily squeezed onto overladen shelves! 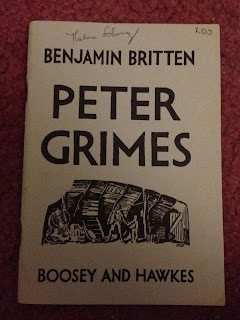 The fun of unearthing them from secondhand stacks like the one pictured is a bonus. All this to say that I climbed up on a conveniently located bar stool and, having admired representative samples of roughly a century of libretto design, triumphantly carried off several additions to my collection. 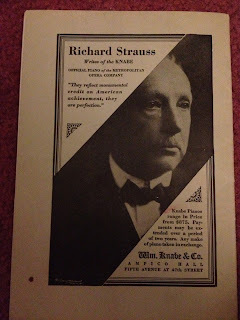 A Tristan libretto fills a lacuna in my Wagner collection, and I found the Art Nouveau design irresistible. 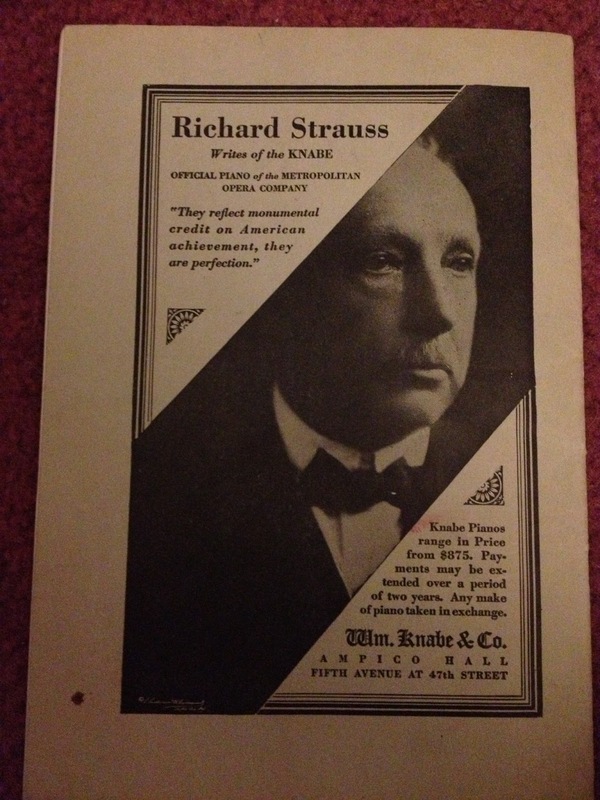 I purchased a Lucia di Lammermoor libretto in the same style primarily for the sake of this full page ad: Nicely done, Knabe Pianos. My discoveries then skip several decades, to this stark (and purse-sized!) 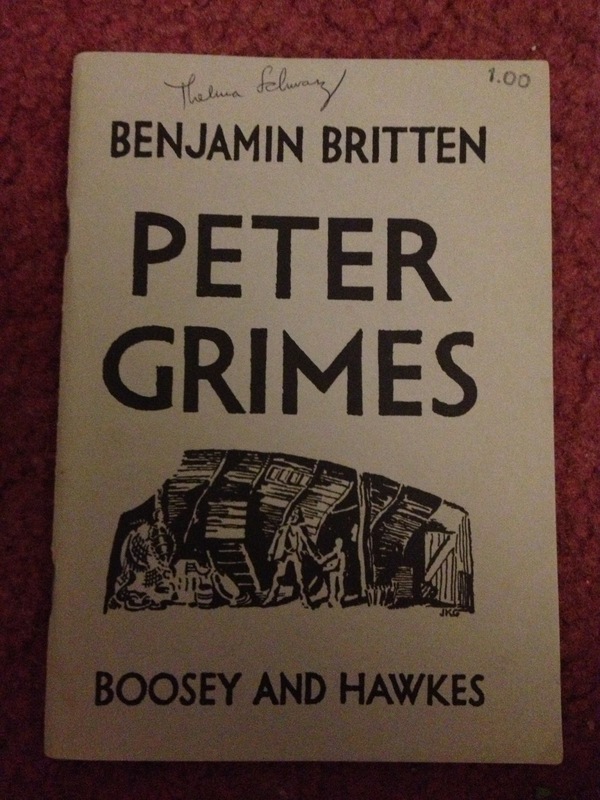 1961 Peter Grimes. Later in the '60s comes this: a reminder of the Met's touring company, with a long description of how the under-construction Kennedy Center was funded and dedicated on the back cover. 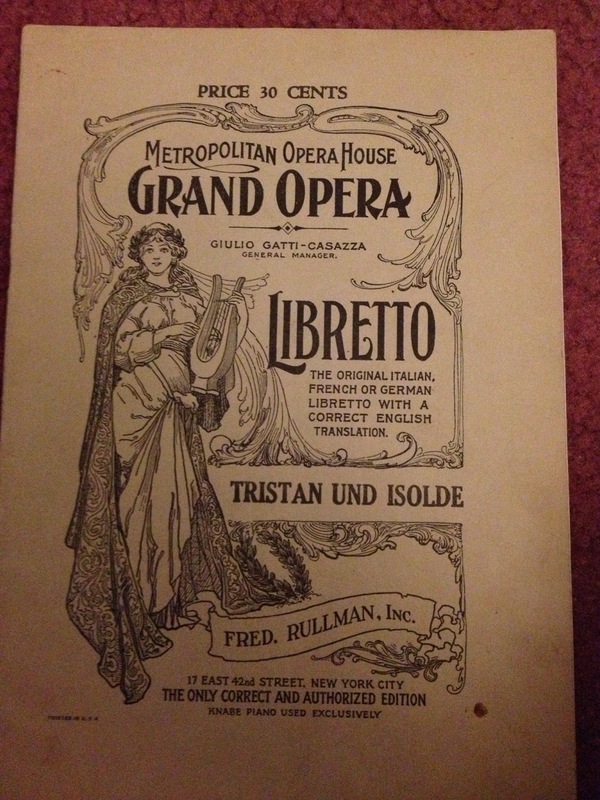 Apparently, the Opera Orchestra of New York used to provide commemorative libretti at each of its performances! Not a few of these have found their way to Westsider Records; most of them seem to have been underwritten by Rolex. 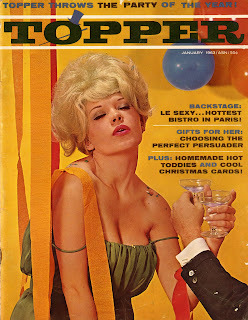 Some of them featured a photo of Eve Queler on the cover; some, like this one, had a design inspired by the opera in question. 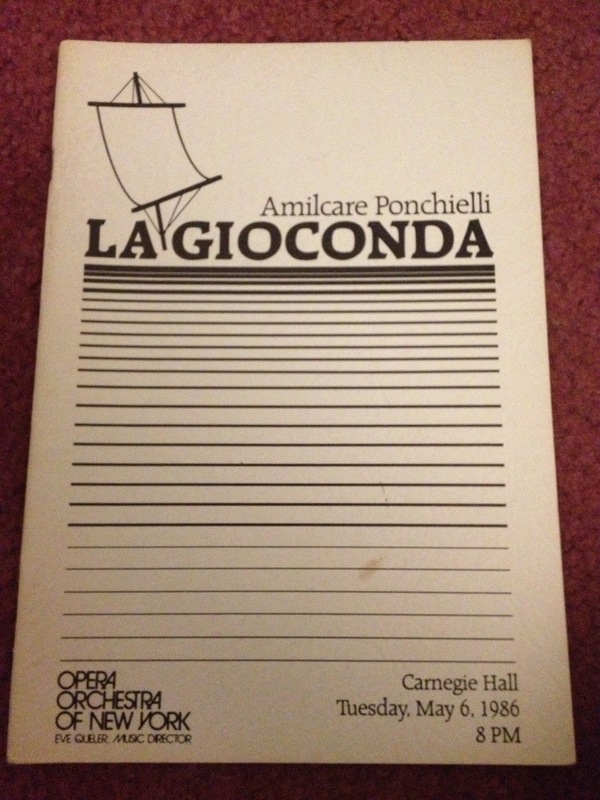 This sleek edition of the sublimely ridiculous La Gioconda libretto was too good to pass up. 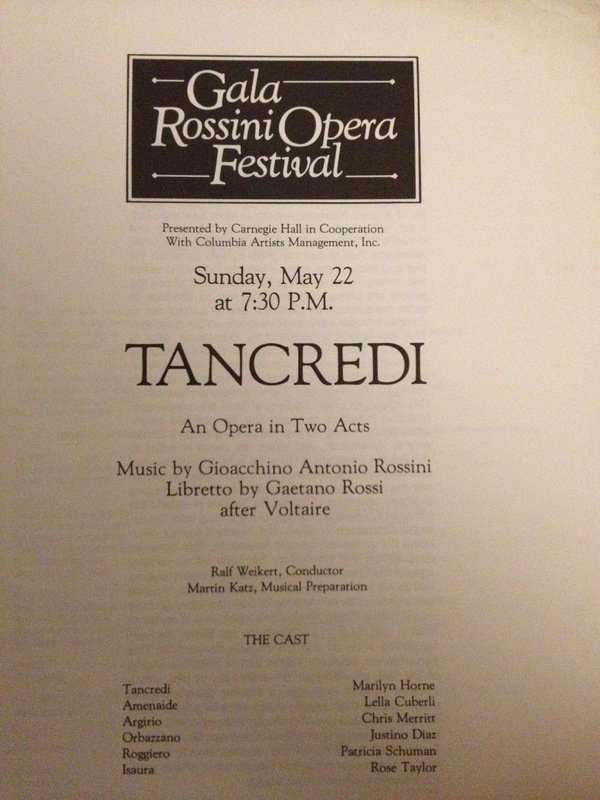 I need to do further research to find out what year saw this gala performance of Tancredi... with Marilyn Horne! 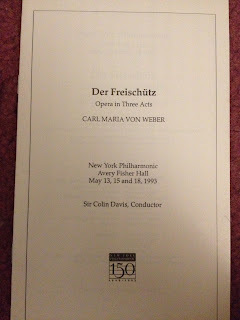 Last but not least, a libretto from a performance of the too-rare Freischütz in the NYPhil's anniversary season under Sir Colin Davis' baton. Really, it's a good thing I'm moving soon, or who knows what else might follow me home. The InsightALT festival of masterclasses, symposiums, and opera performances concluded on Monday with La Reina, a dark, sensual opera for which I'm tempted to coin the term neo-verismo. Composed by Jorge Sosa with a libretto by Laura Sosa Pedroza, the opera was heard in a "first draft" version scored for piano and electronics; the eventual scoring is planned for chamber orchestra and electronics. Mila Henry was the able and energetic pianist; Andrew Bisantz conducted, holding all the elements together, and impressively realizing (I thought) dramatic tension and musical nuance. Sosa named his greatest influences as Saariaho and Messiaen, but I couldn't help hearing this lush, varied score and shamelessly melodramatic plot as reminiscent of Puccini. The opera's topical relevance was singled out twice for praise in the talk-back session (and by opera-goers decades older than I.) I was glad to have this evidence--as well as that of the enthusiastic, even rowdy audience applause--of excitement for a new opera that creatively engages and comments on a complex social problem. The score is rich, allusive, and even playful; the use of musical motifs helps clarify the multilayered relationships among the often dissembling characters. The electronics, here cued by the composer, were used to create a variety of textures, sometimes providing echoes of motifs or phrases, sometimes gunshots and sirens, sometimes a deliberate, deliberately overwhelming cacophony. 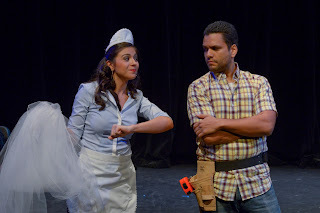 Sosa Pedroza's bilingual libretto, meanwhile, is vivid: poetic and gritty by turns, shifting from the clichéd language of the newsroom or the clipped exchanges of drug bosses to lyrical sweetness for a love duet, and quasi-mystical imagery for the dialogues between Regina Malverde (the "queen" of the title) and La Santa Muerte, an ominous and otherworldly tutelary spirit. 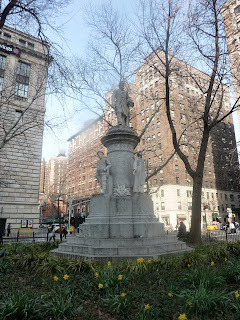 On Saturday, I headed downtown for the penultimate performance of Gounod's Faust, which filled Amore Opera's spring repertory staple slot this year. A fine orchestral performance, and impressively cohesive work from the chorus, supported a strong cast: a very creditable all-around effort. Director Nathan Hull used Amore's limited stable of sets intelligently, creating a staging that juxtaposed Gounod's era and the way that era imagined the opera's ostensible setting. Sixteenth-century urban spaces (looking strangely normal to anyone who's seen F.W. Murnau's amazing film of the story) surrounded townsfolk in mid-nineteenth-century garb, or approximations thereof. This is a strategy that has enjoyed a recent vogue in larger houses, and for Faust, I think it works: the passage of time is, obviously, Faust's main personal worry. In Goethe (cf. this post,) mutability on a larger scale is also a pressing, even torturing preoccupation for many: what good are new forms of knowledge if they don't alleviate human suffering? How do we explain--and counteract--evil if, in a rapidly secularizing society, we can no longer attribute it to diabolic agency? In Hull's production, Marguerite, like Faust, is fascinated by new knowledge and new ways of acquiring knowledge. She occupies her hours of petit bourgeois leisure with a stereoscope, approximating Faust's research and Valentin's travel in the only way allowed to her. Both this and the choreography suggested that the philosopher and the siblings are all the victims of Mephistopheles: a Mephistopheles who is part Caligari , part Dracula, and completely depraved. (As his power grows, his makeup becomes increasingly diabolical; there are visual echoes of Conrad Veidt's deformed hero in The Man Who Laughs . Mephistopheles' costumes and spotlights may be the kind of thing Bernard Shaw famously complained of, but as Goethe's devil remarks, turning Satan into a pantomime terror doesn't rid the world of evil's threat. Often, all Mephistopheles has to do is lurk in the background; the opera's human beings don't need much help damaging each other. On Thursday, I got to visit the open rehearsals of all three operas which will be performed at this year's InsightALT festival, a series of events under the auspices of the American Lyric Theater. Founded in 2005, the American Lyric Theater's primary mission is the commissioning and development of new operas; The Golden Ticket, based on Roald Dahl's beloved fable, is one product of their efforts. This year's festival, consisting of masterclasses and round table events as well as opera performances, runs from May 28-June 3 (tickets here.) In keeping with ALT's commitment to audiences as well as artists, festival events will be live-streamed and archived on Opera Music Broadcast. Although the three partnerships of composers and librettists developed their projects separately, the operas will, I think, complement each other nicely. While composed in very different styles, and dealing with dramatically different characters, each of the works engages in some way with painfully split or hybrid identities. Saturday, May 4 saw the last night of Renee Fleming's "Perspectives" series at Carnegie Hall, and its inventive programming and insightful delivery spoke well both for the artist and for the series concept. The selection and arrangement of pieces resisted any teleological or excessively literal interpretation of how the music represented the window to modernity of the program's title. Intricately interwoven, the selections proved mutually illuminating, with several texts in multiple settings, and sensibilities and styles ranging from the full, complex romanticism of Brahms through the lush sensuality of Strauss and Wagner to sharp minimalism. 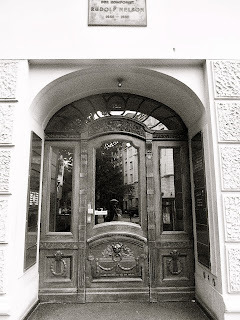 Two of the composers (Wellesz and Zeisl) were new to me; another reminder of the extraordinary artistic ferment of Vienna around the turn of the twentieth century. The artistry of Fleming, Denk, and the Emerson Quartet was likewise not merely intelligent, but itself creative. The Firework-Maker's Daughter, an opera composed by David Bruce with a libretto by Glyn Maxwell, has its U.S. premiere run at The New Victory Theater, which is dedicated to works designed for children. Its inventive staging, engaging musical writing, and charming plot, however, won me--as well as the many children in the audience--over completely. The outlines of its fairy-tale narrative are simple enough, but it plays with those genre traditions, as well as with operatic convention, to craft a work that is anything but superficial or facile. Edward Said might have been thrown into fits by the description of the story's setting ("an imaginary land that brings to mind India, Thailand, China, Indonesia, or some combination of all and none of those places") but I can't imagine the opera itself failing to delight. 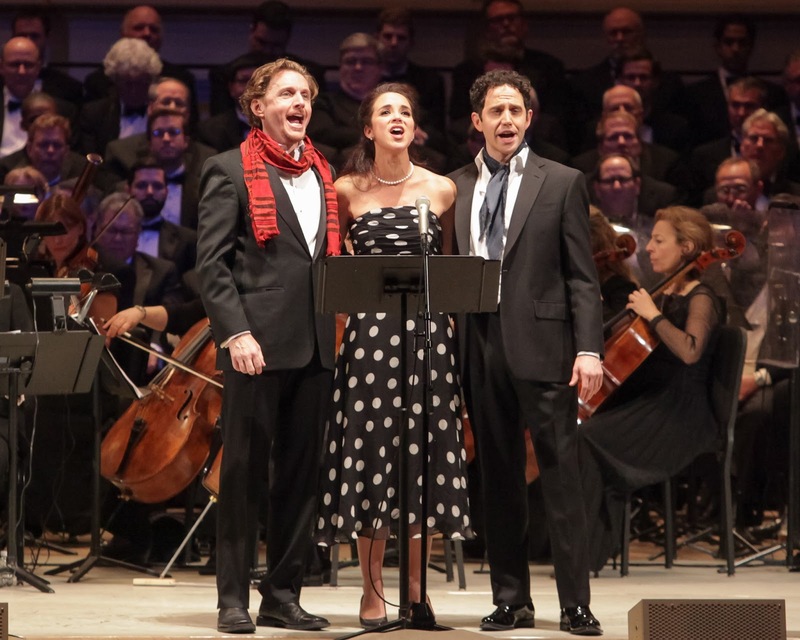 The Opera Group, which gave the work its world premiere earlier this year, has imported the production and cast, and the cohesive, creative ensemble spirit contributed much to the joy of the evening. You'll have to bear with me, Gentle Readers, as I keep using words like joy and delight in describing this work that features Wagnerian allusions and a lovesick white elephant, as well as the independent heroine of the title. The New York Opera Exchange has followed up their inaugural season's Cosi fan tutte with another production of a Mozart/Da Ponte opera commenting on American iniquity. 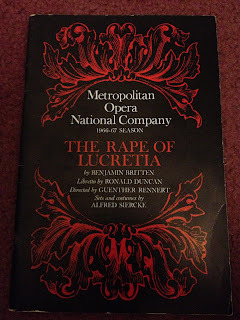 I saw Wednesday's opening night performance of a Don Giovanni set in the nation's capital in a fictionalized 1963. Jennifer Shorstein's minimalist production provided a dark commentary on the amnesties granted by privilege of office in an ostensible meritocracy, and on the personal tragedies created by a society floundering under the burden of hypocritical standards. This production, focusing on oppression based on class and gender, rewrites history: the all-male cliques of licit and illicit power--Don Giovanni is a politician, the Commendatore a mafia boss--are multiracial. While the female members of the chorus are given merely decorative functions--in which they compete and express gratitude for male attention--the three principal women are given distinctive motivations for their social and sexual agency. 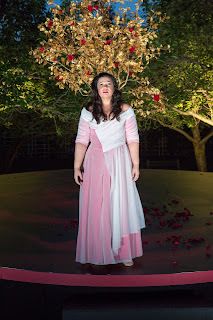 Against the libretto, Donna Anna is presented as giving her consent to Don Giovanni, but outraged and frightened by his failure to fulfill the terms of the social contract as she sees it by entering into a permanent and licit relationship with her. 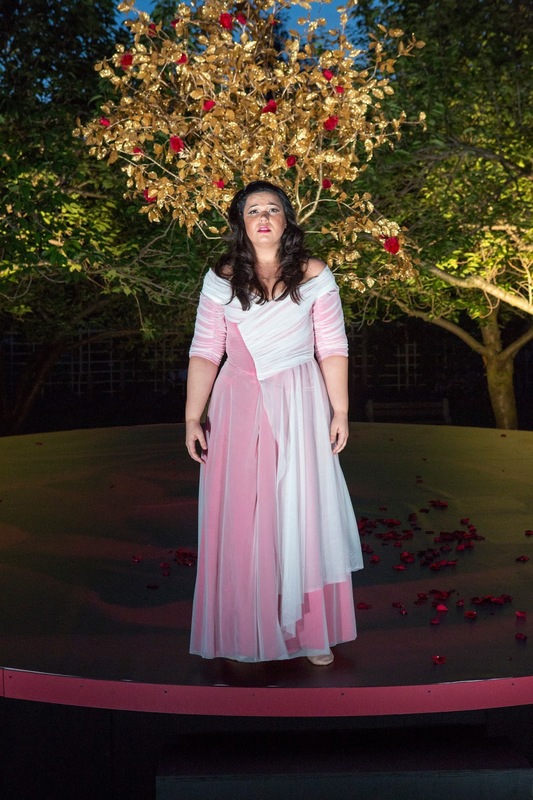 Zerlina, in one of the production's intelligent touches, seems to feel an obligation to live up to the doctrine of free love in "La ci darem," but soon decides that her own free choice lies with Masetto alone. Donna Elvira is not a proud aristocrat, but a woman who, pathetically, pitiably, clings to Don Giovanni as a possible liberator. Her only social resources are a clinging dress and cheap lipstick, and she is destroyed by the society that has created her. And it is this society which is victorious: Don Giovanni is an abuser of power, but not an anarchist, and he is slain by the successor of the crime lord whom he murders. The cycle of cold-blooded violence continues. The orchestra was a newly formed ensemble, and showed considerably improved cohesion over last year's showing, although there were issues in coordination with the singers. This I'm inclined to attribute to the inflexibility of conductor David Leibowitz's tempi. Balance issues in the first act were largely corrected in the second. The strings were occasionally imprecise but acquitted themselves well; the woodwinds performed with some distinction. The horns did well until the final scene, when disaster struck: the Commendatore was heralded with bizarre cacophonies. Fortunately, matters were set right for the final ensemble. On Tuesday night, the eve of May, the Collegiate Chorale presented an appropriately romantic extravaganza at Carnegie Hall. The 1944 Song of Norway was the brainchild of Robert Wright and George Forrest, also responsible for the later and more famous The Great Waltz and Kismet. Commissioned as a light opera, Song of Norway was here presented as a musical, but a happily hybrid one, its material based on the music and life of Edvard Grieg. Melodramatic episodes are heaped with indiscriminate zeal onto a slight plot, but the show boasts considerable charm nonetheless. Dramatic chemistry was intermittent on the night (many of the singers glued to their scores) but the musical values were solid and I enjoyed myself along with the rest of the audience. The American Symphony Orchestra played well under the baton of Ted Sperling, treating sentimental crescendos and sprightly folk rhythms with a schmaltzy sincerity which would have done an MGM extravaganza proud. The ballet artists of the Tom Gold Dance Company credit for doing their best in a constrained space with limited choreography. The Collegiate Chorale was on superb form. As a multifunctional vox populi and provider of sound effects, they sang with good diction and smooth sound, performing their various dramatic functions creditably. A non-professional orchestra and an international soprano might sound like strange bedfellows, but in Sunday's concert of Wagner selections, Christine Goerke and the Greenwich Village Orchestra proved to have a partnership with admirable chemistry. I jumped at the chance to hear Goerke, whom I hadn't encountered live since her Norma in Philadelphia in 2008, and whom New York audiences will next hear as the Dyer's Wife in the Met's Die Frau Ohne Schatten next season. The orchestra proved to be a polished as well as passionate ensemble, a charming reminder of the days when enthusiasts themselves, and not only their stereo sets, were responsible for reproducing the beloved music of the operatic stage. If the strings occasionally lacked in precision or the woodwinds in finesse, it was still a very creditable performance under the baton of Pierre Vallet, who led crisply and cleanly. 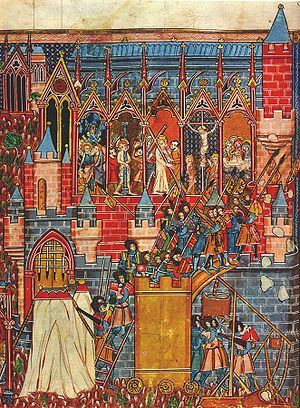 The Tannhäuser overture and bacchanal saw the orchestra at its finest, with each theme given dramatic value, and with sprightliness leavening the pseudo-medieval pomp and ceremony. When Goerke entered, she lit up the hall, embracing its dingy neoclassicism in an expression of radiant joy before launching into "Dich, teure Halle." Elisabeth's effervescent happiness filled Goerke's sound as her sound filled the hall. German nerd that I am, I loved the expression which Goerke gave to text. The very strength of her rich sound seemed almost to work against the desolation of "Allmächt'ge Jungfrau," but perhaps I have insufficient sympathy with Elisabeth's self-denying selflessness. Certainly Goerke sang it beautifully. 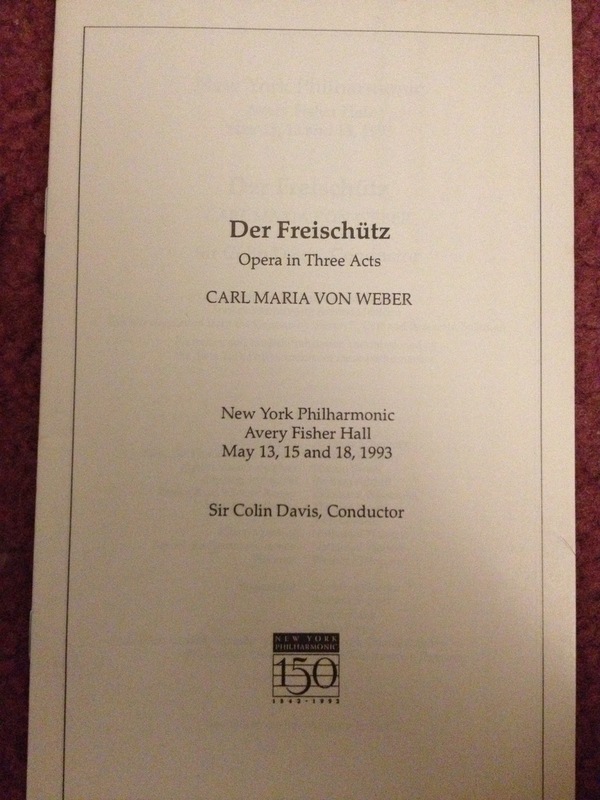 I was delighted that the GVO gave this aria its response, Wolfram's achingly beautiful "O du mein holder Abendstern." Jesse Blumberg sang it with a resonant, warm baritone well-suited to it. I found myself wishing that the legato phrases had been taken more slowly, and that Blumberg's perfectly correct German had perhaps been invested with more poignancy, but judging by aufience response, these reservations placed me in a minority. As I'm a member of a high liturgical tradition, I spent this evening at a Tenebrae service: in a darkened church, reading the penitential psalms. As I'm an opera nerd, this made me think of Puccini: Psalm 51 is Minnie's psalm, read out to and explicated for the miners of La Fanciulla del West. It's been widely recognized (see, for example, William Berger's Puccini Without Excuses ) that this text and Minnie's gloss of it provide brilliant foreshadowing and a point of reference for Minnie's own growth over the course of the opera. Her confidence that no one lies beyond the reach of redemption is challenged when her idolized hero, the gallant Johnson, is revealed to be an infamous bandit, no common thief but the leader of a gang. Minnie's used to seeing--and cultivating--the good in the rough-mannered and often desperate miners. And it's not, in the event, the fact that Johnson is a bandit on which her confidence in her own worldview shatters; this she forgives him, after recovering from her first shock. But that the man to whom she has given her long-guarded heart should have lied to her, should have abused her innocence... this she cannot accept. That she finds her way--first by instinct, then by reason--to the truer understanding of grace which enables her happy ending is celebrated in the triumphantly lush orchestration of the opera's finale. But this scriptural reference does not occur in isolation; Puccini's penultimate opera is imbued throughout with spiritual language. Minnie speaks of wanting to knock at the threshold of heaven, riding in the mountains; the man she loves is constantly calling her blessed. I have a theory that biblical echoes are used by the composer in providing an alternate foreshadowing: a dark vision of the future which Minnie and Johnson only narrowly avoid. 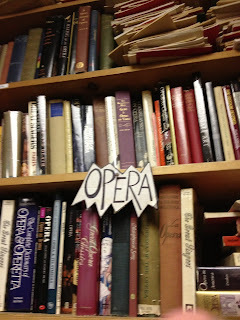 Brace yourselves, Gentle Readers, as I wade again into the murky waters of opera and religion.